HARRISBURG – A little more than two years ago, Luzerne County Correctional Officer Kristopher D. Moules ended his watch, the victim of a violent inmate assault and subsequent fall down an elevator shaft. Tuesday, as Kristopher’s mother Kitty, fellow corrections officers Eric Messersmith and Dwayne McDavitt, Luzerne County Correctional Facility Deputy Warden Sam Hyder, members of the Elevator Safety Board and the International Union of Elevator Constructors looked on, Gov. 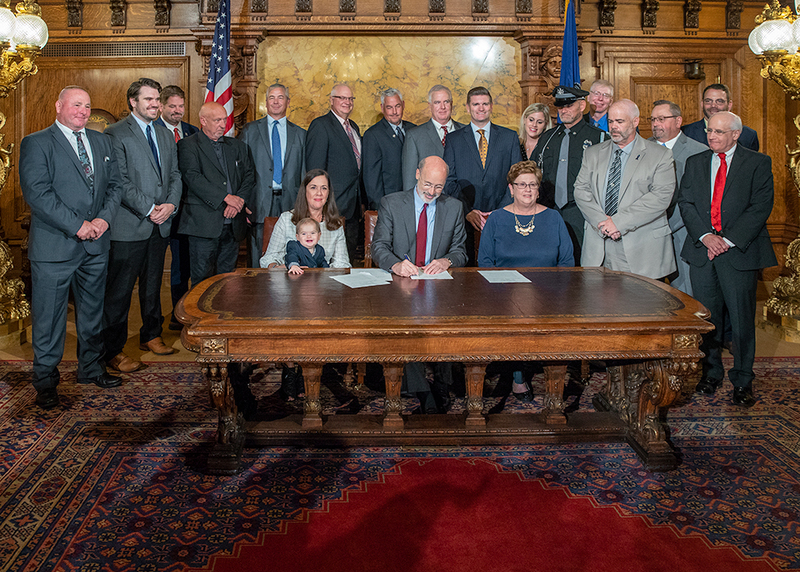 Tom Wolf signed Senate Bill 934 into law. Prior to the ceremony, Sens. Lisa Baker (R-20th) and John Yudichak (D-14th) spoke on the Senate floor about the importance of the act and the inspiration behind it. The bill creates an Elevator Safety Board that will conduct a monthly review of issues related to elevator construction, maintenance and inspection. The body will also have regulatory authority, including the ability to grant exceptions and variances to existing codes, and membership will include those with expertise in the safe operation of elevators. “Kristopher’s Law modernizes Pennsylvania’s elevator safety standards and memorializes the heroic life of Luzerne County Corrections Officer Kristopher Moules by reminding us that a hero remembered never dies,” said Yudichak. Sen. Lisa Baker, Kitty Moules, Sen. John Yudichak and others involved in the crafting of SB 934 look on as Gov. Tom Wolf signs an elevator safety bill into law. The legislation creates an Elevator Safety Board and memorializes the life of Luzerne County Corrections Officer Kristopher Moules, Kitty’s son, who died two years ago.